The word doctor is derived from the word docere, which means “ to teach “. This means that every doctor needs to be a teacher – he needs to teach his patients about their medical problems and their treatment options . Just as it is important for doctors to teach patients, I think it's equally important for patients to teach as well. Patients can be teachers for themselves; for other patients ; and for the doctors as well ! Let’s look at this one by one. Patients need to be self-learners. Teaching and learning is never a one way communication where the teacher pours information into an empty vessel . The patient needs to be actively engaged ; and has to take the time and trouble in order to understand what's happening in his body , so that he can make well-informed decisions about his treatment. He needs to learn how he can utilize information therapy , to become a well-informed patient. Step number one is educating himself . This takes a certain amount of time and trouble , because he needs to learn to decipher medical jargon , but the good news is there are lots of online resources available which can help patients to do so. Secondly patients can teach other patients. Thanks to blogs , bulletin boards and patient forums , it's now possible for expert patients to teach others. Many patients have a research background; and they understand quite a lot about the technical minutiae of medicine, even though they are not doctors. These patients can play an important role in decoding medical gobbledygook , and simplifying this and explaining it to other patients. In fact, expert patients are likely to do a much better job than most doctors do , because they talk in simple everyday English , which patients can understand easily. Equally importantly, they understand the pain points of patients , and this kind of patient to patient teaching and learning is far more effective , because it's coming from first hand experience – from someone who has “ been there, done that “ ! Patients can empathise far more easily with those who are in the same boat in which they find themselves . Finally , patients can teach doctors as well. Every good doctor will accept that he learns a lot from his patients . Instead of patients thinking of themselves as being inadequate or incompetent , they need to understand that the intelligent doctor is happy to learn from their experiences . They need to learn to be articulate ; and to express this in terms with the doctor can understand . This is how the doctor’s knowledgebase about the patient experience of illness increases . While the patient may not teach the doctor anything about the pathology or anatomy of the disease, he can teach the doctor a lot about the patient’s feelings; and how they can cope with the illness. The doctor can use this information to teach other patients who have the same problem . Finally , ambitious patients can actually teach the world about their disease . They can do this by creating websites to create awareness ; and by raising funds in order to encourage research on that particular disease . There are many success stories of innovative patients who have done . Lots of diseases are considered to be “orphans” because pharmaceutical companies are not willing to spend the money to find treatments for them, because it is not cost effective for them to do so . Patients have banded together and raised money to fund researchers to come up with innovative therapeutic options for these diseases ! While it's no fun being a patient, you can transmute this experience into a positive one by trying to find ways and means of helping others. This actually helps you heal sooner, because the best way of helping yourself is to help others ! Does IVF cause premature menopause ? Do IVF drugs increase the risk of cancer ? Another very funny post by Dr Kishore Shah ! How to delight your patients ! 3 free books for caring doctors ! Does taking supplements help IVF patients ? Why do doctors want to be so busy ? 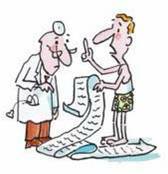 Why do doctors order so many tests ? Why is IVF documentation so poor in India ?